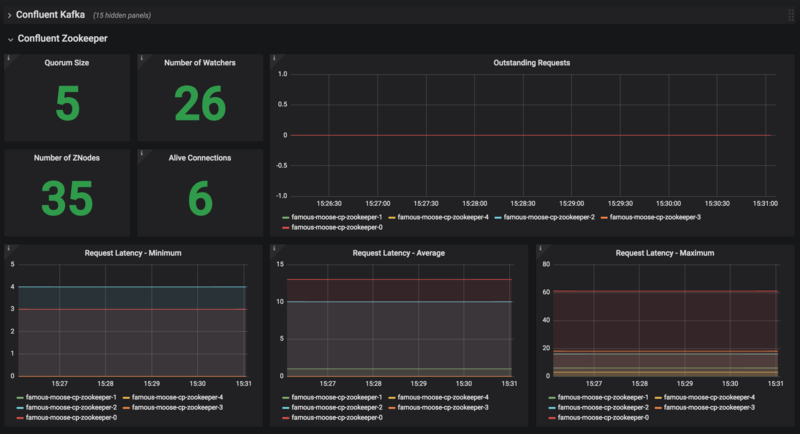 You can use the Helm charts to deploy Confluent Platform services on Kubernetes for development, test, and proof of concept environments. The Confluent Platform Helm charts are in developer preview and are not supported for production use. Helm is an open-source packaging tool that helps you install applications and services on Kubernetes. Helm uses a packaging format called charts. Charts are a collection of YAML templates that describe a related set of Kubernetes resources. You must have a Kubernetes cluster that has Helm configured. For local Kubernetes installation with Minikube, see Appendix: Create a Local Kubernetes Cluster. Follow the directions to install and deploy Helm to the Kubernetes cluster. View a list of all deployed releases in releases in the local installation. For Helm versions prior to 2.9.1, you may see "connect: connection refused", and will need to fix up the deployment before proceeding. Follow these steps to run Confluent Platform. The ZooKeeper and Kafka cluster are deployed with StatefulSets that have a volumeClaimTemplate which provides the persistent volume for each replica. You can define the size of the volumes by changing dataDirSize and dataLogDirSize under cp-zookeeper and size under cp-kafka in values.yaml. To adapt this example to your needs, read the Kubernetes StorageClass documentation. The StorageClass that was created can be specified in dataLogDirStorageClass and dataDirStorageClass under cp-zookeeper and in storageClass under cp-kafka in values.yaml. To deploy non-persistent Kafka and ZooKeeper clusters, you must change the value of persistence.enabled under cp-kafka and cp-zookeeper in values.yaml . These type of clusters are suitable for development and testing purposes. The StatefulSets are going to use emptyDir volumes, this means that its content is strictly related to the pod life cycle and is deleted when the pod goes down. Install a 3 node ZooKeeper ensemble, a Kafka cluster of 3 brokers, 1 Confluent Schema Registry instance, 1 REST Proxy instance, and 1 Kafka Connect worker in your Kubernetes environment. Naming the chart --name my-confluent-oss is optional, but we assume this is the name in the remainder of the documentation. This step is optional: to verify that Kafka is working as expected, connect to one of the Kafka pods and produce some messages to a Kafka topic. List your pods and wait until they are all in Running state. Connect to the container cp-kafka-broker in a Kafka broker pod to produce messages to a Kafka topic. If you specified a different release name, substitute my-confluent-oss with whatever you named your release. Wait for a > prompt, and enter some text. Press Control-d to close the producer session. Consume the messages from the same Kafka topic as above. You should see the messages which were published from the console producer. Press Control-c to stop consuming. Deploy a ZooKeeper client pod. Deploy a Kafka client pod. Now that you have Confluent Platform running in your Kubernetes cluster, you may run a KSQL example. KSQL is the streaming SQL engine that enables real-time data processing against Apache Kafka. All scaling operations should be done offline with no producer or consumer connection. The number of nodes should always be odd number. Scaling Kafka brokers without doing Partition Reassignment will cause data loss. You must reassign partitions correctly before scaling the Kafka cluster. JMX Metrics are enabled by default for all components, Prometheus JMX Exporter is installed as a sidecar container along with all Pods. To remove the pods, list the pods with kubectl get pods and then delete the pods by name. To delete the Helm release, find the Helm release name with helm list and delete it with helm delete. You may also need to clean up leftover StatefulSets, since helm delete can leave them behind. Finally, clean up all persisted volume claims (pvc) created by this release. There are many deployment options to get set up with a Kubernetes cluster, and this document provides instructions for using Minikube to set up a local Kubernetes cluster. Minikube runs a single-node Kubernetes cluster inside a VM on your laptop. You may alternatively set up a Kubernetes cluster in the cloud using other providers such as Google Kubernetes Engine (GKE). Minikube version 0.23.0 or higher is required for docker server https://github.com/moby/moby/pull/31352[17.05], which adds support for using ARG in FROM in your Dockerfile. First follow the basic Minikube installation instructions. Then install the Minikube drivers. Minikube uses Docker Machine to manage the Kubernetes VM so it benefits from the driver plugin architecture that Docker Machine uses to provide a consistent way to manage various VM providers. Minikube embeds VirtualBox and VMware Fusion drivers so there are no additional steps to use them. However, other drivers require an extra binary to be present in the host PATH. The following command increases the memory to 6096 MB and uses the xhyve driver for the native macOS Hypervisor. Start Minikube. The following command increases the memory to 6096 MB and uses the xhyve driver for the native macOS Hypervisor. Work around Minikube issue #1568.